It’s hard to believe that I haven’t published a new recipe on here since July last year! I haven’t forgotten about Cheese & Chickpeas at all: I’ve still been cooking and adding recipes in draft posts and taking pictures but I have been more focused on other projects. At the grand age of 48 I think I’ve finally decided what I want to be when I grow up! I’ve created a number of websites over the past few years, both for my own projects and for friends’ businesses but since September it’s been official, I am a website developer 🙂 I’m looking forward to doing some work on the blog design now I’ve really got to grips with the inner workings of WordPress and CSS and child themes and the like. In the meantime you can check out my business at Websites By Lucy. While I haven’t been focused on this blog, my partner has put a lot of time into developing an Android app version of Cheese & Chickpeas so watch this space. Now on to today’s recipe. I adapted this buckwheat and aubergine bake recipe from a dish by Emma Galloway in the June 2016 issue of Vegetarian Living and it’s become a firm favourite weeknight dinner. 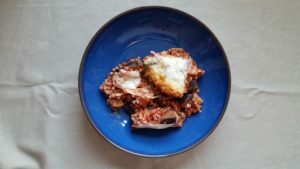 We’ve always liked Aubergine Parmigiana (my go-to recipe for that is the one in Jamie’s Italian) and this has similar elements but with the added bonus of buckwheat, which makes it more substantial and more of a complete meal. If you haven’t come across buckwheat before it’s a gluten-free grain which you can buy either raw or toasted and is sometimes called kasha. I get the raw version from our local wholefood shop because that’s what they happen to sell but I think you could use either type in this recipe. Put 250ml water into a pan with a sprinkle of salt and bring to the boil. Add the buckwheat, cover with a lid and simmer gently on a low heat for 15-20 minutes (until it has absorbed all of the water and is tender). In a large pan heat the olive oil and add the cubed aubergine. Cook stirring well for about 10 minutes. Add the garlic, a sprinkle of chilli flakes (optional) and the oregano. Cook for another minute stirring. Add the tinned tomatoes and tomato puree and bring to the boil. Stir in the red wine vinegar, a good grind of black pepper and the cooked buckwheat. Put into an ovenproof dish and lay the mozzarella over the top.